Address: Jõulumäe Sports and recreation centre, Leina village, Tahkuranna parish, Pärnumaa, Estonia. http://joulumae.ee The sports centre is located in the vicinity of the E67 (Via Baltica) not far from the Latvian border. 12:00 – 13:00 Registration, vet. control, equipment control, race track open for viewing only on skiis or sled. Dogs are not allowed on the trail before the competition in order to keep good trail conditions. The award ceremony will start within 2 hours after the last competitor has finished. The length of the trail in Sp2, SW1, SM1 classes is 5,7 km and in Sp6, Sp4, SW2, SM2 classes 7,3 km. The relay trail length is ca 1,5 km. The track is best described as a forest trail with slight ascents and descents. In case of bad weather and snow conditions the competition will take place on another trail with artificial snow. Short videoclips from trail. A competitor is allowed to have a maximum of two starts per heat. All dogs excluded from the nordic breed category. At least 3 nordic breed entries in one class. The nordic breed category is divided into RNB1 and RNB2 subcategories under the condition that they each have at least 3 entries in RNB1-category and RNB2-category. All competing dogs must be healthy, vaccinated and microchipped. In Sp2 class the dogs must be at least 18 months old. 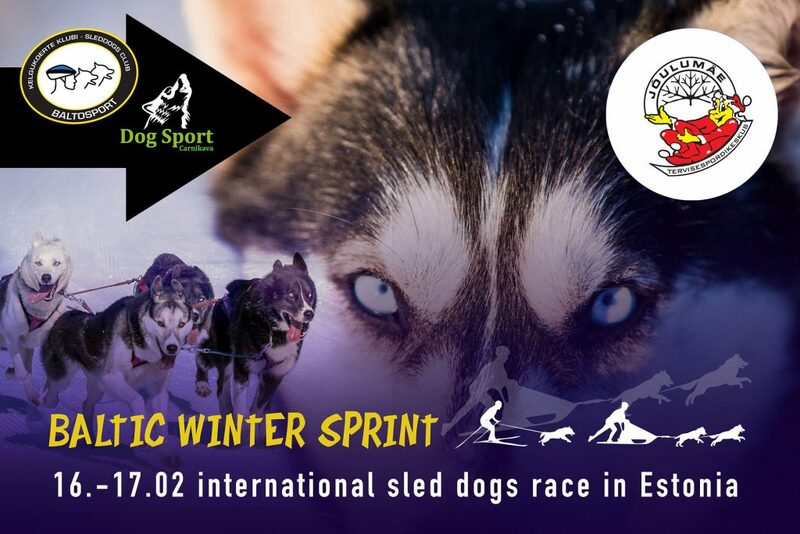 In Sp4, Sp6 and skijoring classes the dogs must be at least 12 months old. All dogs racing in nordic breed category must have a FCI registrated pedigree, otherwise they have to compete in open class. All dogs are allowed to have maximum of two starts per day. Switching dogs during the competition is not allowed. It is mandatory to present the dog´s veterinary passport at the on-site veterinary check. All competition equipment must be in accordance with the IFSS race rules. Competitors are allowed to share their equipment with one person if they have notified the organisers via registration form and if they do not start twice using the same equipment. Competitor´s second start – 5 € off the registration fee. Registration fee includes musher’s dinner on Saturday evening. For non contestants Musher’s dinner is 10€ per person. Your registration is confirmed successfully after we have received registration fee via bank transfer on Kelgukoerte Klubi Baltosport account. No cash payments on race day! IBAN: EE94 2200 2210 5480 3650 / Swift (BIC): HABAEE2X / Bank name: SWEDBANK AS / Bank adress: Liivalaia 8, 15040 Tallinn. 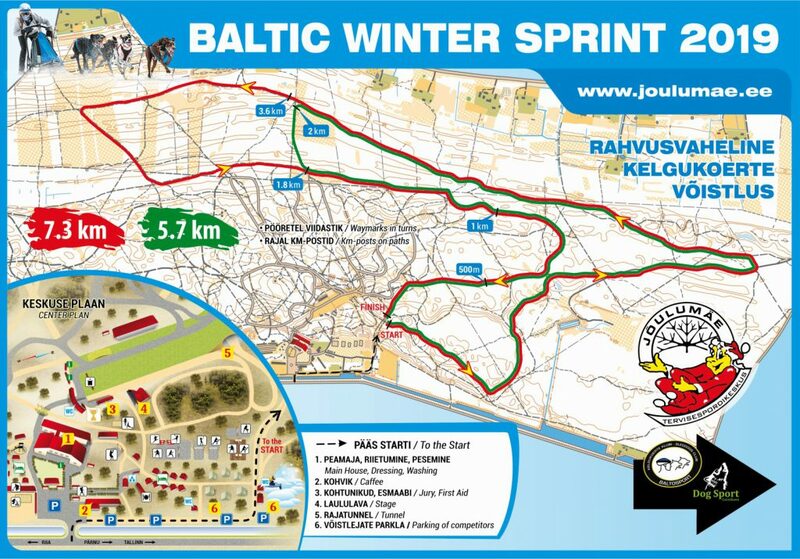 In payment order write: Baltic Winter Sprint, race class and category, competitor name(s), amount of extra tickets to lunch and dinner on Saturday. All competitors who finish the race receive a diploma, the first three from each class receive a medal and special prizes from various sponsors. If there are at least 5 veterans or juniors in the skijoring class they will be awarded separately from adults. Jõulumäe Sports and Recreation Centre. For information and booking please contact info@joulumae.ee or call +372 445 6117 (EST, ENG, RUS).Jõulumäe Sports and Recreation Centre is big enough to accommodate all the participants! Dogs are allowed in the rooms for a fee of 6 € for the whole stay and they need to be kept in cages. It is possible to book breakfast for Saturday (16th February) and Sunday (17th February) and lunch for saturday and sunday. Meals (except Mushers’ dinner on saturday) have to be booked along with accommodation by writing an e-mail to info@joulumae.ee or calling +372 445 6117. When booking meals put down the date, breakfast, lunch or dinner and the quantity. Advertising and selling products at race area is free for race sponsors. Others 50 € (2 days). The competition organiser reserves the right to make changes if necessary. Please refer to our website or Facebook event for additional information.